The Villages at Red Mill Pond in Lewes, DE is a unique resort-style community situated around the scenic lake it is named after. With plans for 520 affordable homes by K. Hovnanian and NV Homes, this picturesque community offers something for everyone. Located near one of the state's largest freshwater lakes, Red Mill Pond gives residents stunning water views. Homeowners have direct access to the pond and the opportunity to enjoy water sports, such as boating and kayaking, as well as walking the trails that travel around the water's edge. When ocean views are desired, the state's picturesque beaches are also close by. The attractive community of The Villages at Red Mill Pond in Lewes features a wide variety of amenities that make living in the community appealing, such as curbed lined streets and sidewalks, new and resale homes with a wide variety of floor plans and a 6,000 square-foot community clubhouse, complete with a pool and fitness center. The Villages at Red Mill Pond features a wide variety of amenities that offer residents resort-style living, including low-maintenance, easy-care lawns and landscaped common areas. 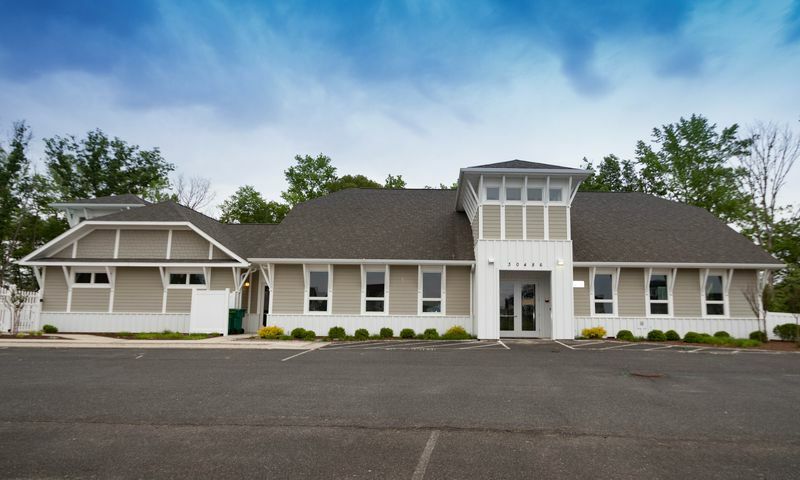 The community's hub, a 6,000 square-foot clubhouse, features many amenities, including a pool, a exercise room, hobby and game room, catering kitchen, and billiards. Outdoors, there are a wide variety of nature walking trails that wind throughout the community and to the water's edge of Red Mill Pond where a gazebo and boat launch awaits. Homes within The Villages at Red Mill Pond feature two single-family collections from 1,200 to 3,211 square feet. Most models are built with crawl spaces and some offer second-floor guest bedrooms. Houses feature high-quality exteriors and interiors. On the outside of the home, you can expect durable and long-lasting qualities, such as low-maintenance, dent-free beaded vinyl siding, vinyl soffit and aluminum fascia, seamless aluminum gutters and downspouts and insulated carriage style garage doors. The homes also come with a professionally designed landscaping package, concrete driveways, 25-year asphalt roof shingles and two-car garages. On the inside of the elegant homes at Red Mill Pond you ll find a wide variety of luxury, resort-style features, such as a hardwood entry foyer, 2-panel wood-grained painted Classique interior doors, nickel door hardware, crown molding in the dining and living rooms and volume 9-foot ceilings on the first floor. The kitchens come fully equipped with a wide variety of GE luxury appliances, including a self-cleaning range, multi-cycle dishwasher and 20 cu. ft. refrigerator with ice-maker. In the bathroom, there are a wide variety of desirable features, including decorate Moen faucets and full-size vanity mirrors. Life at Red Mill Pond is carefree and active. The lack of lawn maintenance and ready access to the lake and nearby beaches gives residents plenty of activities from which to choose. There are also plenty of fun neighborhood activities and events being held on a regular basis, including various interest groups and clubs. You will often find the resdients of The Villages at Red Mill Pond planning holiday parties, kayaking trips, book club meetings, nature walks, card games, and more. The Villages of Red Mill Pond in Lewes, Delaware is an active lifestyle community in Sussex County. Not too far outside the community of Red Mill Pond is the Delaware shore, which offers residents a wide variety of entertainment opportunities, including beach access, state parks and wildlife areas and golfing. Also nearby is downtown Georgetown, which gives residents access to a county airport and amenities such as churches, eateries and shopping. When a day-trip is in order, the city of Dover is easily accessed. The state capital offers residents of Red Mill Pond plenty of entertainment and sightseeing opportunities, including the Schwartz Center for the Arts, where residents can enjoy entertainment opportunities such as orchestra concerts and ballet, and the Sewell C. Biggs Museum of American Art and the Delaware State Museum. The Villages at Red Mill Pond is a great community for a wide variety of homebuyers in Southern Delaware. Clubhouse - 6,000 Sq. Ft. There are plenty of activities available in The Villages at Red Mill Pond. Here is a sample of some of the clubs, activities and classes offered here. K. Hovnanian offers single-family homes ranging in size from 1,200 to 2,239 square feet. Most of these homes offer two to four bedrooms, two to three-and-a-half bathrooms, and an attached two-car garage. The Calhoun floor plan is available on a resale basis only. These single-family homes built by NV Homes have open floor plans and elegant designs. Some homes feature second floor guest bedrooms or lofts. All five models can be found on a resale-only basis with two to four bedrooms, two to three-and-a-half bathrooms, and a two or three-car garage. Friendly people. The community itself is not kept up. Common areas are full of dirt and weeds. Clubhouse does not have enough room for ALL who live here. Clubhouse furnishings are old and filthy as is the carpet. I CANNOT IN GOOD FAITH TELL ANYONE TO MOVE INTO THIS COMMUNITY. After the last snowstorm, at least 25 homes had structural damage due to faulty roof construction by builder sub-contractors. In the past, many homes had multiple warranty repair issues. In many cases, fulfillment of the repairs were delayed. After this latest series of construction flaws, it would be difficult to recommend this builder and developer (who could not have the streets and fire hydrants cleared in a timely manner). LOVE the location, convenience, amenities, our home and neighbors! Best decision to purchase here. We like the small scale of Red Mill Pond and the nice outdoor features. Walking through the community after dinner or early in the morning is one of our favorite things to do. The lake is vey nice too and great for an easy kayak or canoe trip. 55places.com is not affiliated with the developer(s) or homeowners association of The Villages at Red Mill Pond. The information you submit is distributed to a 55places.com Partner Agent, who is a licensed real estate agent. The information regarding The Villages at Red Mill Pond has not been verified or approved by the developer or homeowners association. Please verify all information prior to purchasing. 55places.com is not responsible for any errors regarding the information displayed on this website.